They flew in from Sydney on a Royal New Zealand Air Force flight carrying the Kiwi team who took part in the Games, an Olympic style sporting event for wounded soldiers that Prince Harry helped found.? There were tears and applause as the royal couple were showered with gifts, including a New Zealand ‘Buzzy Bee’ toy, which Harry held aloft to the delight of the crowd. “I can’t believe this has happened, I can’t believe that I met the royals,” said Victoria O’Brien, still sobbing several minutes after the royal couple had moved past her. 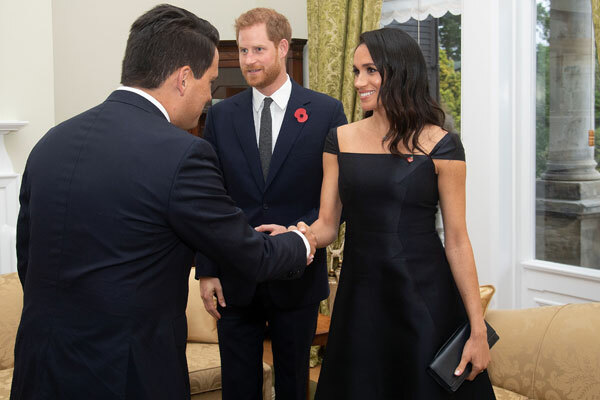 The royals then returned to Government House for meetings with Ardern and the leader of the opposition Simon Bridges, ahead of a reception hosted by the Governor-General marking the 125th anniversary of women’s suffrage. Just before Bridges was to meet the prince a fire alarm went off, forcing the evacuation of the building and leaving dozens of women who were invited to the reception standing outside in the cold in their evening outfits, many holding drinks. A Government House representative later said it was a false alarm caused by a vegetable steamer in the kitchen. Harry and Meghan’s itinerary over the following three days includes a hike and barbecue in the Abel Tasman National Park at the top of the South Island, a reception with Ardern at Auckland War Memorial Museum and a visit to the popular North Island tourist resort of Rotorua. ? The couple will then head back to Auckland before flying out on Thursday to end a marathon tour which also took in Fiji and Tonga.